Aldosterone 3. 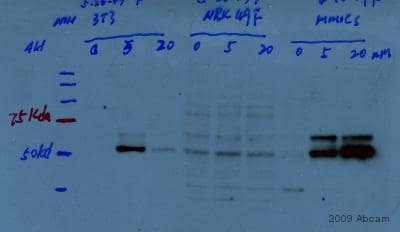 This antibody was produced using the anti idiotypic method. Our Abpromise guarantee covers the use of ab2774 in the following tested applications. ab2774 blocks the binding of aldosterone since it is directed against the steroid binding domain of the mineralocorticoid receptor. IHC-P 1/100. 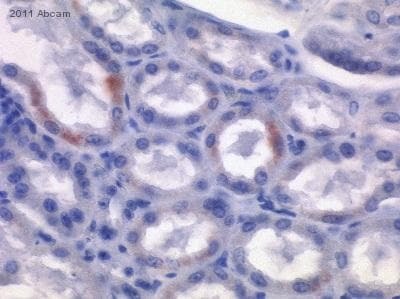 Immunohistochemical staining of MR in rabbit atrium with ab2774 results in strong staining of myocytes and endothelial cells. In immunohistochemical studies, staining with ab2774 is blocked by pre incubating the sample with aldosterone. WB 1/250. Predicted molecular weight: 107 kDa. 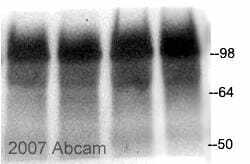 By Western blot, this antibody detects a 116 kDa protein representing MR in rabbit heart homogenate. Due to the extremely low levels of MR expressed in native tissues, it is recommended that enhanced detection systems be used for Western blotting such as enhanced chemiluminescence. Receptor for both mineralocorticoids (MC) such as aldosterone and glucocorticoids (GC) such as corticosterone or cortisol. Binds to mineralocorticoid response elements (MRE) and transactivates target genes. The effect of MC is to increase ion and water transport and thus raise extracellular fluid volume and blood pressure and lower potassium levels. Ubiquitous. Highly expressed in distal tubules, convoluted tubules and cortical collecting duct in kidney, and in sweat glands. Detected at lower levels in cardiomyocytes, in epidermis and in colon enterocytes. Defects in NR3C2 are a cause of autosomal dominant pseudohypoaldosteronism type I (AD-PHA1) [MIM:177735]. PHA1 is characterized by urinary salt wasting, resulting from target organ unresponsiveness to mineralocorticoids. There are 2 forms of PHA1: the autosomal dominant form that is mild, and the recessive form which is more severe and due to defects in any of the epithelial sodium channel subunits. In AD-PHA1 the target organ defect is confined to kidney. Clinical expression can vary from asymptomatic to moderate. It may be severe at birth, but symptoms remit with age. Familial and sporadic cases have been reported. Defects in NR3C2 are a cause of early-onset hypertension with severe exacerbation in pregnancy (EOHSEP) [MIM:605115]. Inheritance is autosomal dominant. The disease is characterized by the onset of severe hypertension before the age of 20, and by suppression of aldosterone secretion. Cytoplasm. Nucleus. Endoplasmic reticulum membrane. Cytoplasmic and nuclear in the absence of ligand; nuclear after ligand-binding. When bound to HSD11B2, it is found associated with the endoplasmic reticulum membrane. Immunohistochemistry (Formalin/PFA-fixed paraffin-embedded sections) - Anti-Mineralocorticoid Receptor antibody [H10E4C9F] (ab2774)Image courtesy of an abreview from Mrs. Barbara Heitkönig. Formalin-fixed, paraffin-embedded cow kidney tissue stained for Mineralocorticoid Receptor using ab2774 at 1/200 dilution in immunohistochemical analysis. Heat mediated Antigen retrieval using Citrate buffer, 10 mM pH 6.0 was used. ab2774 (4µg/ml) staining mineralocorticoid receptor in human pancreas, using an automated system (DAKO Autostainer Plus). Using this protocol there is strong staining of the islets of Langerhans and some weaker staining of the exocrine cells of the pancreas. Immunocytochemistry/ Immunofluorescence - Anti-Mineralocorticoid Receptor antibody [H10E4C9F] (ab2774)Image courtesy of an anonymous Abreview. ab2774 staining Mineralocorticoid Receptor in hamster CHO K1 cells by Immunocytochemistry/ Immunofluorescence. The cells were formaldehyde fixed and then blocked using TBS, 3% Dried Milk, 0.1 % Triton X-100 for 20 minutes at 22°C. Samples were then incubated with primary antibody at 1/100 for 1 hour at 22°C. The secondary antibody used was a goat anti-mouse IgG conjugated to FITC used at a 1/400 dilution (left hand image). In the right hand image DAPI was used to stain the cell nuclei blue. Overlay histogram showing HEK293 cells stained with ab2774 (red line). The cells were fixed with methanol (5 min) and then permeabilized with 0.1% PBS-Tween for 20 min. The cells were then incubated in 1x PBS / 10% normal goat serum / 0.3M glycine to block non-specific protein-protein interactions followed by the antibody (ab2774, 1/20 dilution) for 30 min at 22°C. The secondary antibody used was DyLight® 488 goat anti-mouse IgG (H+L) (ab96879) at 1/500 dilution for 30 min at 22°C. Isotype control antibody (black line) was mouse IgG1 [ICIGG1] (ab91353, 2µg/1x106 cells) used under the same conditions. Acquisition of >5,000 events was performed. This antibody gave a slightly decreased signal in HEK293 cells fixed with 4% paraformaldehyde (10 min)/permeabilized in 0.1% PBS-Tween used under the same conditions. Immunohistochemistry was performed on both normal and cancer biopsies of deparaffinized Human colon carcinoma tissues. To expose target proteins heat induced antigen retrieval was performed using 10mM sodium citrate (pH6.0) buffer microwaved for 8-15 minutes. Following antigen retrieval tissues were blocked in 3% BSA-PBS for 30 minutes at room temperature. Tissues were then probed at a dilution of 1:100 with a mouse monoclonal antibody recognizing Mineralocorticoid Receptor ab2774 or without primary antibody (negative control) overnight at 4°C in a humidified chamber. Tissues were washed extensively with PBST and endogenous peroxidase activity was quenched with a peroxidase suppressor. Detection was performed using a biotin-conjugated secondary antibody and SA-HRP followed by colorimetric detection using DAB. Tissues were counterstained with hematoxylin and prepped for mounting. Immunohistochemistry was performed on both normal and cancer biopsies of deparaffinized Human tonsil tissue tissues. To expose target proteins heat induced antigen retrieval was performed using 10mM sodium citrate (pH6.0) buffer microwaved for 8-15 minutes. Following antigen retrieval tissues were blocked in 3% BSA-PBS for 30 minutes at room temperature. Tissues were then probed at a dilution of 1:100 with a mouse monoclonal antibody recognizing Mineralocorticoid Receptor ab2774 or without primary antibody (negative control) overnight at 4°C in a humidified chamber. Tissues were washed extensively with PBST and endogenous peroxidase activity was quenched with a peroxidase suppressor. Detection was performed using a biotin-conjugated secondary antibody and SA-HRP followed by colorimetric detection using DAB. Tissues were counterstained with hematoxylin and prepped for mounting. Immunohistochemistry was performed on both normal and cancer biopsies of deparaffinized Human kidney tissue tissues. To expose target proteins heat induced antigen retrieval was performed using 10mM sodium citrate (pH6.0) buffer microwaved for 8-15 minutes. Following antigen retrieval tissues were blocked in 3% BSA-PBS for 30 minutes at room temperature. Tissues were then probed at a dilution of 1:200 with a mouse monoclonal antibody recognizing Mineralocorticoid Receptor ab2774 or without primary antibody (negative control) overnight at 4°C in a humidified chamber. Tissues were washed extensively with PBST and endogenous peroxidase activity was quenched with a peroxidase suppressor. Detection was performed using a biotin-conjugated secondary antibody and SA-HRP followed by colorimetric detection using DAB. Tissues were counterstained with hematoxylin and prepped for mounting. Immunofluorescent analysis of Mineralocorticoid Receptor using Mineralocorticoid Receptor Monoclonal antibody (H10E4C9F) ab2774 shows staining in HEK293 cells. Mineralocorticoid Receptor staining (green) F-Actin staining with Phalloidin (red) and nuclei with DAPI (blue) is shown. Cells were grown on chamber slides and fixed with formaldehyde prior to staining. Cells were probed without (control) or with or an antibody recognizing Mineralocorticoid Receptor ab2774 at a dilution of 1:20-1:200 over night at 4 ?C washed with PBS and incubated with a DyLight-488 conjugated secondary antibody. Images were taken at 60X magnification. Immunofluorescent analysis of Mineralocorticoid Receptor using Mineralocorticoid Receptor Monoclonal antibody (H10E4C9F) ab2774 shows staining in HeLa cells. Mineralocorticoid Receptor staining (green) F-Actin staining with Phalloidin (red) and nuclei with DAPI (blue) is shown. Cells were grown on chamber slides and fixed with formaldehyde prior to staining. Cells were probed without (control) or with or an antibody recognizing Mineralocorticoid Receptor ab2774 at a dilution of 1:20-1:200 over night at 4 ?C washed with PBS and incubated with a DyLight-488 conjugated secondary antibody. Images were taken at 60X magnification. Immunofluorescent analysis of Mineralocorticoid Receptor using Mineralocorticoid Receptor Monoclonal antibody (H10E4C9F) ab2774 shows staining in HepG2 cells. Mineralocorticoid Receptor staining (green) F-Actin staining with Phalloidin (red) and nuclei with DAPI (blue) is shown. Cells were grown on chamber slides and fixed with formaldehyde prior to staining. Cells were probed without (control) or with or an antibody recognizing Mineralocorticoid Receptor ab2774 at a dilution of 1:20-1:200 over night at 4 ?C washed with PBS and incubated with a DyLight-488 conjugated secondary antibody . Images were taken at 60X magnification. Publishing research using ab2774? Please let us know so that we can cite the reference in this datasheet. I am using this antibody in WB of mouse brain tissue lysates and getting no bands. I have loaded 10-60ug of total protein. The membrane is blocked with either BSA or milk. I have tested antibody concentrations 1:1000 - 1:200. Can I try another antibody to this target? Thank you for contacting Abcam regarding ab2774. Our lab recently purchased three antibodies (Nitrotyrosine, Mineralocorticoid Receptor and TNF-a) from Abcam. We have stored them at our refrigerator on getting them without checking them out. Today I took them out to make aliquots and noticed the two (MR: ab2774 and TNF-a: ab6671) of them are empty. I do not know what happened on them. As you know they are very expensive. Please let me know what I can do for them. Thank you for contacting us and letting us know about this problem It is possible that the water evaporated from the vials, as both of these antibodies were supplied in small volumes and sometimes the water does evaporate. Ab2774 should contain 100µl of liquid, and ab6771 should contain 40µl. I recommend first spinning the vials down to make sure there is no liquid in the cap. Then, add deionized water until the vials contain the appropriate volumes. If you do have any problems with the functionality of these antibodies, please let me know and I will be happy to send you replacement vials. I did not order this antibody, I was given an aliquot. The Ab catalog # is ab2774 (H10E4C9G, Mineralcorticoid Receptor) and I would like to know the concentration of the Ab in the 100ul vial that was originally purchased. The data sheet does not contain this information. I do not need to know the concentration of a starting dilution, just the concentration of the Ab itself. For example: 10ug/100ul. I have already contacted Abcam via phone and they did not have access to this information. Thank you for your enquiry. As the purity of ab2774 is ascites, and is therefore unpurified antibody, we cannot provide a concentration. Please contact us again if you have any additional questions. Some days ago I ordered an antibody from your company. I have recieved the package today. Unfortunatly, the tube you sent me does not contain any liquid material, however, according to the data sheet it should be formulated as 100 microliter liquid, (ascities diluted in PBS). The antibody ordered is the mouse monoclonal [H10E4C9F] one against the mineralocorticoid receptor (ab2774; LOT 58328). Please contact me as soon as possible in order to try to solve this problem.